This Registration Button and Snippet Code that can be placed on any page building software like Leadpages, Clickfunnels, Optimize Press, Instapages, UnBounce, Wix, Wordpess, and More. This new widget allows you to build out customizable buttons and use them on any site anywhere. Or use just the snippet code to place behind any button you prefer that already exist on your favorite page building software. Because both Widget Button and the Widget Sign up Form / Box itself is super customizable to your brand! This widget can be located in the publishing options of a created event. If you want to add the button to any page, first edit and create your button. From there, you can even test your button and widget to see the awesome branding you’ve added to it. And finally, if you decide you’d like to add in your own Thank you page, you can easily do so by adding the link directly in the field we provide you. 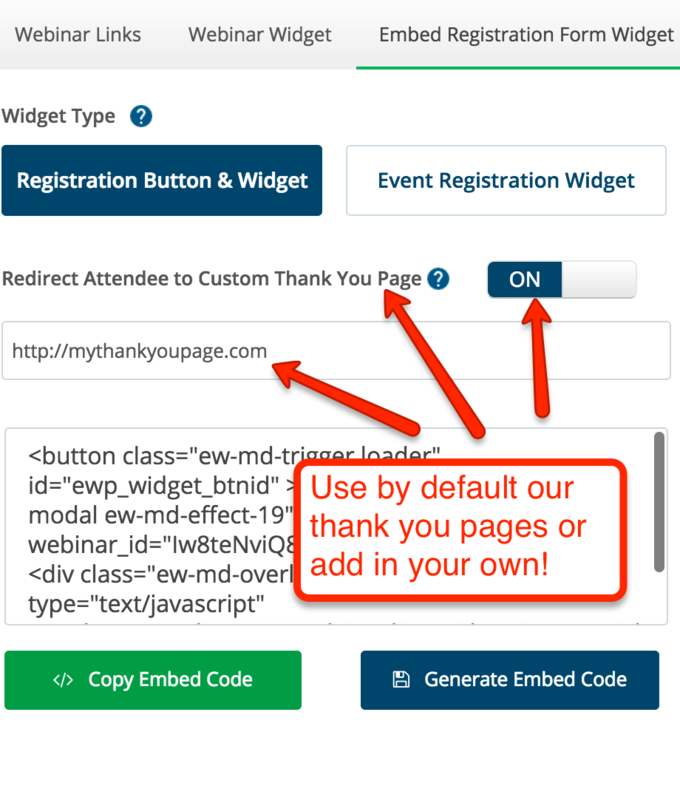 By default we use your EasyWebinar thank you pages that you create when you build out your webinar. Our thank you pages are awesome and have viral share incentives, calendar buttons, the attendee unique url, ticket printing capabilities, video area, description area and a countdown…but hey, we know some people like to stick to their own pages. look and feel of your webinar form to match your existing branding for greater conversions! then you would go in and get the webinar registration button or embed snippet.